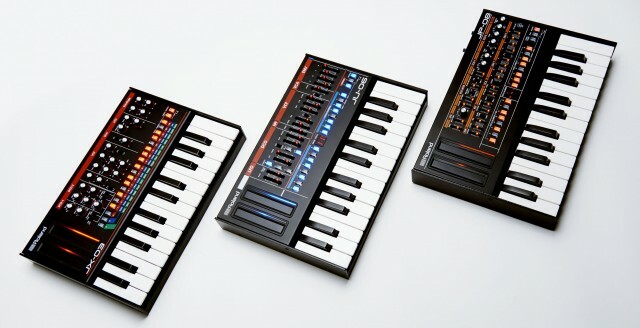 Roland’s “Boutique” Synths are now here officially, after most of the details of these mini synths leaked out in advance of their launch. And we get a real look at this line of inexpensive, mini synths – three models, with an optional keyboard dock. First up, Mitch Gallagher has a hands-on for retailer Sweetwater, the first I’ve seen. It’s a 9-minute “Sweetwater Minute” which is to say… it’s made up of several minutes chained together? The most important thing about the Boutique series is that Roland says they’re powered by Analog Circuit Behavior (ACB) – that’s the same modeling employed in the AIRA series, and it’s been pretty well-received there. They also give you a lot of hands-on control, and they’re not expensive. That combination I suspect will make them a big hit. At the same time, the main thing is whether you’ll want these particular models. There are a lot of ways you could spend your money here, from other synths to soft synths to loading software models onto Roland’s own AIRA SYSTEM-1. And, of course, this prompted speculation as to why Roland didn’t just keep releasing software models for the SYSTEM-1. That seems obvious. One, the SYSTEM-1’s control layout doesn’t really suit every software model – or, really, almost any software model other than the original. Two, it seems there’s more money to be made selling new hardware, not to mention to customers who find this appealing but not the SYSTEM-1. We also know at last what the “boutique” moniker means. Roland says these are a limited edition, though from one of the largest instrument makers in the world, it’s hard to know precisely what that means. Anyway, we do get color-graded, hipster-friendly images of the line if that makes you feel any better. But no, let’s be honest: these will appeal if you wanted a model of one these synths in standalone, mobile form. If you hate mini keys, the good thing about that dock is, you can also use these modules with your favorite keyboard. Metal, dude. If you hate plastic, the front panel here is made of metal (though it appears to have a plastic chassic, and the dock is plastic). Curious how these feel. They use USB or battery power. Bus power works, too, so you don’t need a wall wart. And that’s only 4 AA’s. The batteries can go in the dock, too. USB works for MIDI and audio. That is a full-fledged audio interface there. And you can run MIDI over USB. And there are still dedicated MIDI DIN jacks. That combination means I do think one of these modules might make a smart purchase. You already own a keyboard with MIDI out, right? Solo, unison, polyphonic. This makes loads of sense, too. They’re chain-able. That adds polyphony. But it involves chaining together two of the same unit, and I can’t imagine anyone outside a Roland dealer doing that. You want the JP-08, right? I mean, seriously. 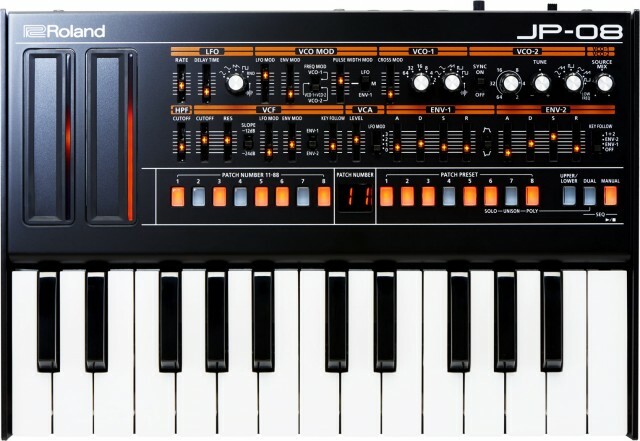 The JX-03 cleverly puts the PG-200 controller on the JX-3P keyboard, but … the appeal for both the JU-06 and JX-03 seems to me primarily for people who owned those keyboards; I’m not sure these are the best-aging sounds in synth history. The JP-08 Jupiter is really the sound it seems that has the largest draw; the control layout looks great and the sound is indeed lust-worthy. 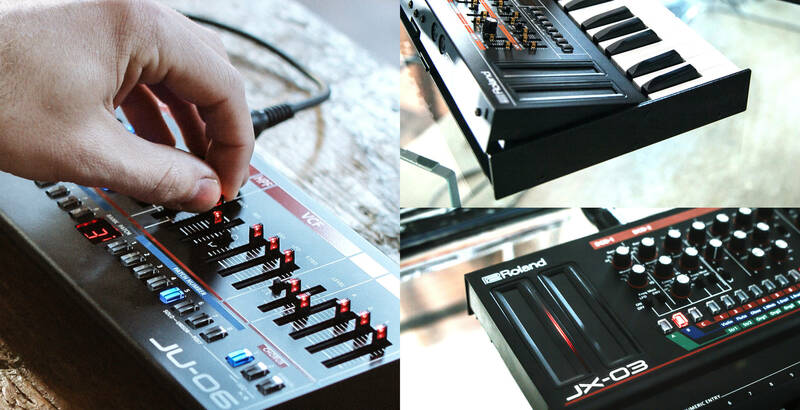 Heck, Roland even priced the JP-08 $100 more than the other two, almost as if knowing it’d be the one in demand. It’s like the “this is the one you really want” tax. And let’s talk about the JP-08. Apart from the dual ribbon controllers and portability, the JP-08 improves on the original Jupiter-8 with extra waveforms and an expanded VCO range. I’m going to try to get a JP-08 for a proper review, so let me know if you have questions. Reading comments, my take is obviously different. People either hate this and jump into expletives or immediately want all three. Right, then. Anyway, have at the official site.